Children can be carried in many different ways. You can, for example, use the oldest carrier in the world – your hands, but every parent knows, that you can't function like that in the long run. Until recently in Europe it was considered that space occupied by the baby can be restricted to those three dimensions: cot, pram and floor. Hands were and still usually are inaccessible or are very restricted blessing (because even if somebody loves carrying babies, he or she cannot do it all the time, even just for an hour). And children love to be carried! And nobody can deny it. You may ask this question: is it a consequence of egoistic attitude towards the world, or do they simply need it to develop properly? 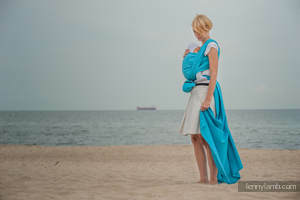 Conclusion: Babywearing is not a new trend or parents' whim – it is very deeply ingrown in our consciousness and well known for generations.It is also an atavism, which probably allowed the human beings to survive and grow in power. It is a natural answer to the newborn baby and the parents' needs. 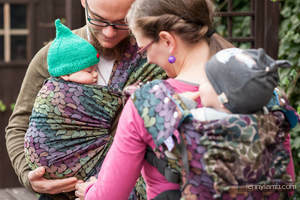 In Europe babywearing tradition is just starting to regenerate, but in many cultures it is well known and passed down from one generation to another. The world of a modern mum is not as easy as it once was. Nowadays parents must be ready for everything. The time of multigenerational families is gone forever, and the first days of motherhood are not always easy. A wrap and babywearing can definitely resolve a lot of new parents problems even if it is not the cure to all evil. Definitely find out why!!! Are there any other ways a wrap can help you and your baby? Birth of a baby is a huge experience for every parent. It is a turning point where your life changes significantly. The world around you is going crazy, and you are trying to find yourself in this new reality again. Just think of how your baby feels now – it is no longer in his/her cosy, snug and worm rumbling tummy, he/she cannot hear mummy’s soothing heartbeat and all the sounds are now very clear. No wonder sometimes your baby feels sorrow and fear, feels lonely and needs your closeness. Babies usually expresses their emotions by crying and only calm down, when they are snug in your arms, with familiar smell and heartbeat. In the 90s the research was conducted - it confirmed unambiguously that carrying babies reduces crying both during the day and night. Your baby doesn't need to cry! Newborn’s colic is the hardest test, new parents have to face. Nothing can soothe the baby crying for hours and neither doctors nor parents can provide a definite explanation to what the real reasonis . It is still not confirmed whether we are really dealing with colic, gastrointestinal cramps or maybe it is a reaction to new, unfamiliar experiences.There is also a theory that colic is triggered by too much stimulation and stress that a little baby has to face in the first month of its precious life. Rarely do babies worn in wraps experience such a painful colic. It may be because, it is easier to care for the baby snug in the fabric and protect it from too much stimulation. Also, during babywearing walks in the tummy-to-tummy position, baby’s abdomen is gently massaged and warmed up at the same time. It is very difficult to replicate this natural massage in other conditions, and its advantages are praised by many doctors, physiotherapists and parents experienced in kangaroo care. It is a problem that some parents have to deal with within the first weeks ofthe baby’s life. It is advisable to be careful till baby has his/her first hip scan. To protect baby’s fragile hip joints specialists recommend to wear the baby in a ‘froggy’ position. Wearing a baby in a wrap can help to avoid hip dysplasia and when diagnosed helps fighting it. It is because of the baby’s position in a wrap: slightly rounded back, legs spread wide (spread squat position), tummy close to the wearer’s body. Not only are you hands-free but you also get huge freedom. Imagine yourself in the following situation - pushing huge pram: lift, stairs, narrow passageways, bumpy curbs, sandy beach, rocky mountain paths,field and woodland tracks on your dream holidays. Whilst babywearing you can reach the tops, and it does not matter that in the beginning it will only be the smallest hill. Once you try it you will feel you can do anything. 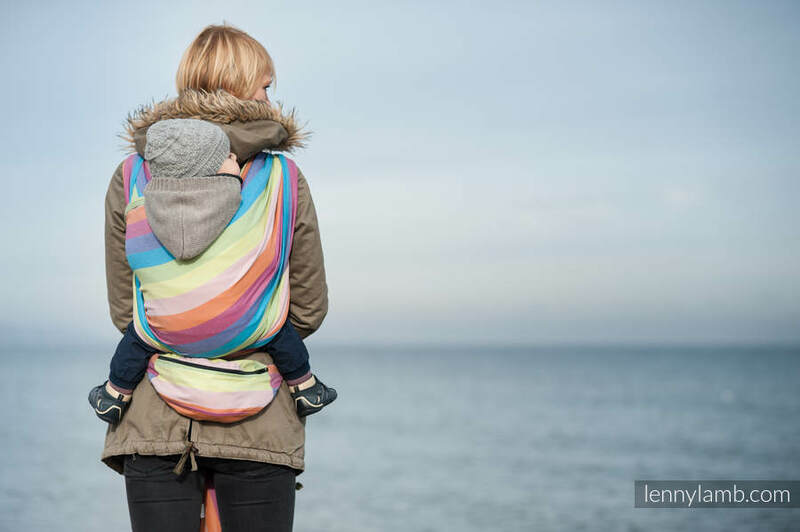 You can clean, cook, hang your washing, do shopping, read, work on a computer, play with the older child, take the dog for a walk – all this whilst babywearing. At the same time you can enjoy being close to your baby and build this special bond. You love wearing your baby but your back refuses to obey? A wrap is a perfect choice !!! 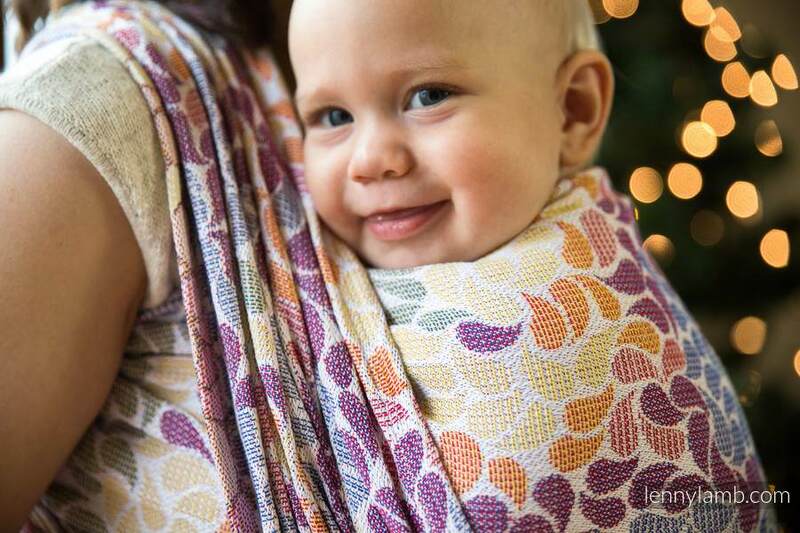 A wrap is a very comfortable way of wearing your baby. The weight of your little one is evenly distributed on your shoulders, back and tummy. Now you can wear your baby almost without any restrictions and without an effort! 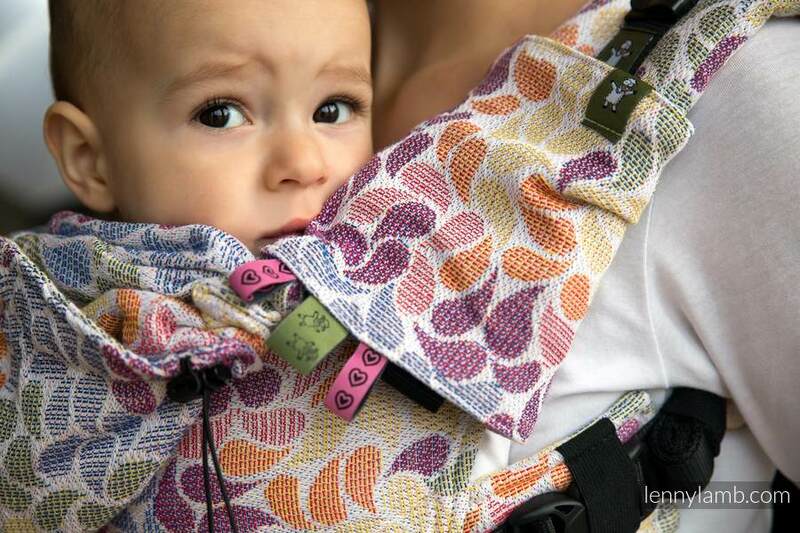 A wrap allows you to keep your baby close. You can always respond to your little one’s needs, which you can easily acknowledge and understand. Your little bundle of joy knows that he/she can trust you and that makes your baby a lot calmer. It then makes you more comfortable and confident in your new role. You know, you are doing it right. Not only will a wrap help you in motherhood, but it could also become a favourite piece of clothing. Interesting patterns and colours will let you choose something suitable for every occasion.